Home › 7Felicity Classic Genuine Leather Notebook5.3" X 4" Refillable Pages Leather ..
7Felicity Classic Genuine Leather Notebook5.3" X 4" Refillable Pages Leather .. Designed in a Pocket Size:13.5cm * 10cm * 2 cm(5.3inch * 4inch * 0.79inch).It is very convenient to carry with when you are on travel or vacations.Great for creative writing,essay writing,diary, agenda,daily plan,ideas on your life's journey,poem etc. Refillable:Three kinds of inserts are included in the notebook(Lined paper,Blank paper, kraft paper) to meet your daily usage.Also a forth insert of paper will come with the package as standby.You will get FOUR inserts in all. Pages:180 pages,90 sheets.Include lined paper(60 pages),blank paper(60pages) and kraft paper(60 pages).These Acid-free papers take pen or pencil beautifully. 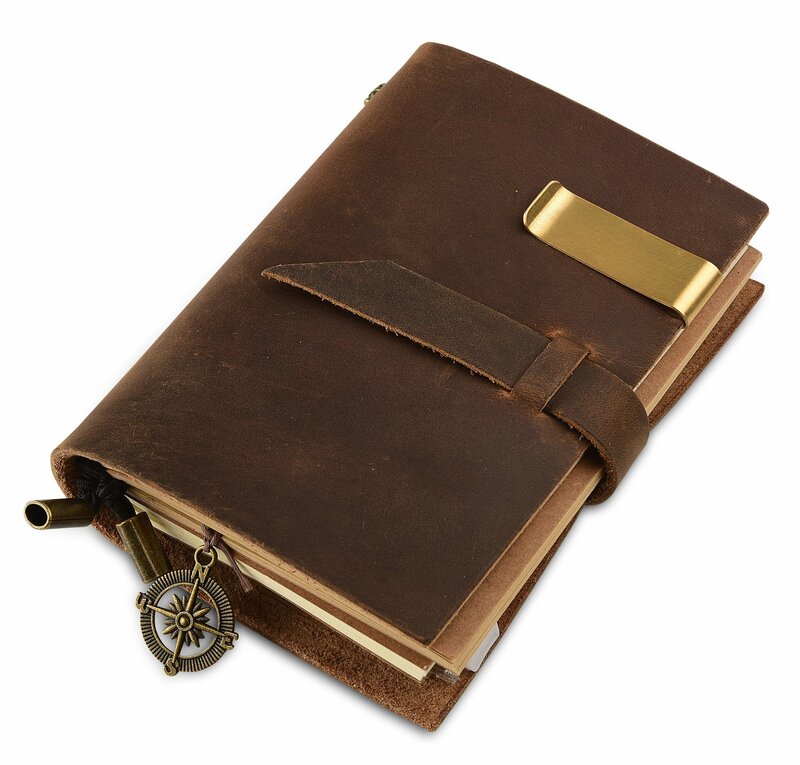 Unique and Personized:100% handcrafted and made of 100% Genuine Leather.We add an exquisite brass compass pendant as a place-keeper and a brass pen holder for this vintage notebook.You have to try this classic journal if you pursue rustic and retro feel. Include 2 card slots and a zipper pouch :Carry around your ID,credit and debit cards,and cash without having to take your wallet with you.Make life easier.The buckle closure of this notebook makes it secure. 7Felicity 12S Leather Journal for you(Pocket Size) This high-end leather journal comes in a classic & simple style and has been manufactured to the highest quality. Its super fine and pleasant scent of genuine leather will instantly send you back to the old days.The handmade notebook cover has a wonderful hand feeling.The quality of the leather will never disappoint you. It's durable enough,Luxury enough.It will let you can't help but want to use to record your life every day! The pages are entirely manufactured from only the best paper and well suited to use with ink, ballpoint pens and plain pencils. Great Gift Idea for Collectors & Renaissance Fanatics If you are looking for a renaissant journal,and if it has caught your eyes,do not hesitate to purchase this.This notebook will never disappoint you. Natural weathering and leather variations add unique character.It's a classic way to record thoughts and experiences. It is without a doubt a remarkably individual gift and a valuable possession full of personality. Multifunctional and humanized design of this leather notebook. Refillable:Three inserts in the journal and one standby insert in the package. Wallet Design:Include two card slots for ID,Credit and debit card,hotel card.Include a zipper pouch as cash pocket or for some gadgets. Add a pen holder and a place-keeper(brass compass).